You may have seen recent media coverage, outlining the potential impact of research carried out at the Baker Heart & Diabetes Institute. Recently published in the Theranostics journal, the research is being hailed as a potentially promising new diagnostic and treatment tool for cancer patients. Cardiologist and CVD researcher, Professor Karlheinz Peter heads the Baker Institute’s Atherothrombosis and Vascular Biology lab. 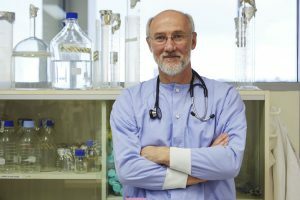 Prof Karlheinz Peter (pictured) and his team have developed an antibody to hunt platelet cells. Originally, the intent was to help combat the blood clots that cause strokes and heart attacks. What they found in the process, however, is that this antibody is also attracted to platelet-loving cancer cells. By pairing the antibody with fluorescent molecules, it becomes a promising diagnostic tool for a wide variety of cancers. Combine it with chemotherapy drugs, and it has potential to become a powerful new way to target and fight tumours.